Former president Goodluck Jonathan continued his attack on the Muhammadu Buhari administration on Friday saying that Nigerians only fear Buhari but do not trust him. Jonathan had earlier described the Buhari administration of being characterised by lies and propaganda while welcoming a chairmanship aspirant of the Peoples Democratic Party (PDP) Professor Tunde Adeniran and his campaign team, in his office in Abuja on Thursday. The former president continued his blitzering attack on the administration when his media office accused the federal government and the Special Adviser to President Buhari on Media, Mr Femi Adesina of peddling falsehood over claims that Nigerians did not protest the hike in fuel price by the Buhari government because they trusted the government. In his response to Adesina and the federal government, over the claims, Jonathan’s Media Office said fear, not trust was why Nigerians did not protest en masse against fuel price hike under Buhari, ThisDay reports. “When Femi Adesina says that it is because of trust that Nigerians did not rise up against the Buhari administration when it increased the pump price of petrol from N87 to N145, he betrays a deep ignorance and arrogance. “First of all, it was not Nigerians that rose up again the Jonathan administration when that government increased the price of petrol on January 1, 2012. It was actually members of All Progressive Congress who sponsored the protests,” said the statement signed by Mr Reno Omokri on behalf of Jonathan Media Office. The statement said Nigerians had not so soon forgotten how Mr Nasir El-Rufai led other chieftains of the opposition to Gani Fawehinmi Freedom Park, Ojota, Lagos, where they attracted crowds by inviting top musicians to perform and by giving out free food and drinks. It continued: “On December 15, 2015, the Nigerian Army, under President Muhammadu Buhari’s command, killed 347 unarmed Shiite men, women, children and infants and buried them in a mass grave as revealed by the panel of inquiry instituted by Kaduna State government. “The excuse given by the military for this massacre was that the Shiites had blocked a road during one of their procession and this allegedly affected a trip by the chief of army staff. After killing his followers and destroying their place of worship, Mr Ibrahim Zak Zaky, spiritual leader of the Nigerian Shiite community, was illegally and unconstitutionally detained and has not been seen or heard of in public since December 15, 2015. “So when the Buhari administration increased the pump price of petrol, Nigerians wisely reasoned that if the Buhari administration can kill 347 unarmed Shiite men, women, children and infants for blocking a road, it would be suicidal to give them an opportunity to do the same thing to them on a wider scale,” said the statement from Jonathan Media Office. Under Buhari administration, it said human life had become so cheap that the military and security services routinely kill innocent Nigerians be it Shiites, peaceful demonstrators or IDPs at the Rann IDP Camp. “To say Nigerians trust an administration that publicly boasted that it would not tell Nigerians how much of their own money the President spent in treating himself in London when the State House Clinic cannot boast of ordinary Panadol (by his own wife’s testimony) is to speak a lie. Nigerians can judge the nature of the man whose number one campaign promise was that “no Nigerian Public official should receive medical treatment overseas at public expense”. For him lies are cheap even if they are expensive for the Nigerian public who has to pay the price. “Nor have Nigerians forgotten the promise to end corruption when the $25 billion Nigerian National Petroleum Corporation scam is ringing in their ears along with the denials by the Vice President that he never approved any contracts. How can they trust a government that has still not released or acted on the SGF’s grass cutter contract probe after six months? 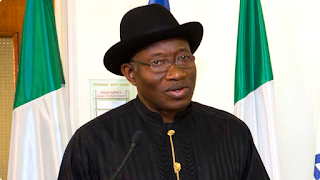 “In the five years that he governed Nigeria, President Goodluck Jonathan spent N16 trillion. The economy grew. The Naira was stable. We had the greatest expansion of infrastructure since the Gowon years and inflation was in single figures. In the two years that President Muhammadu Buhari has ruled Nigeria, he has spent N15 trillion. We have had recession. Naira collapsed. “Inflation has gone back to double digits and the only infrastructure that he has started and completed is the Daura helipad. So Femi should spare us his propaganda and accept the truth that he is the mouthpiece of a murderous regime sustained by propaganda and surviving on corruption,” the statement from Jonathan Media Office said.